eligibility criteria as per MCI norms they can apply online from 04-05-2018 to 25-05-2018 through official website or maharecruitment.mahaonline.gov.in website. 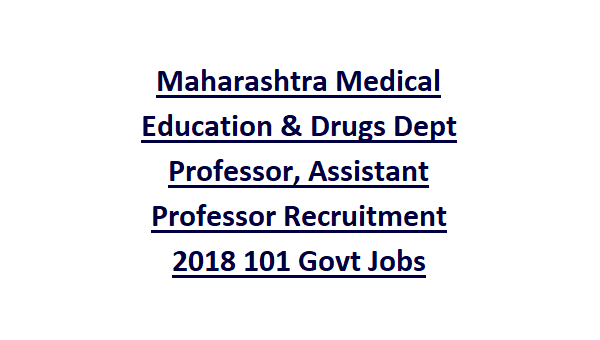 There are total 101 Professor and Assistant Professor Jobs in this Maharashtra Medical Education and Drugs Department. Candidates selection for this Medical Education & Drugs Department Assistant Professor jobs will be based on qualifications and work experience. More information about this Assistant Professor jobs of Maharashtra Medical Education Department vacancies subject wise, age limits, qualification and other details are given below. 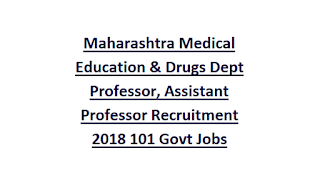 There are total 101 posts in this Maharashtra Medical Education and Drugs Department recruitment 2018. For Asst Professor jobs upper age limit is 40 years and for reserved candidates 45 years. For Professor jobs upper age limit is 50 years and for reserved candidates 55 years. 3 years Jr Resident in a recognized medical college in the concerned subject and 1 year as Sr Resident in the concerned subject in a recognized medical college. Candidates selection will be based on educational qualifications and teaching experience. Online mode of applications are accepted for this Maharashtra Government Medical Colleges Faculty Recruitment 2018. Last date submit application form online is 25-05-2018.